Birds can be not only lovely, but useful as well. They can create a splash of color and a lilting song, and they also help make summer days more pleasant by eating mosquitoes and other pests. Plant a variety of native plants and shrubs. You can check with a local nature center about what birds are likely to appear in your area, and what plants will attract them. Then look for those plants that will thrive in the kind of yard you have. You probably will want to augment your planting with bird feeders. There are different feeders that dispense different kinds of food, from sunflowers to thistle seeds to suet. Choose the types of feeders that are appropriate for the birds you want to attract. Hang multiple feeders throughout your yard. Take care to avoid putting feeders where cats could easily prey on the birds. Squirrel-resistant feeders can help keep squirrels from eating all the bird seed, but squirrels are pretty determined, so even squirrel-resistant feeders are not likely to be 100 percent successful. 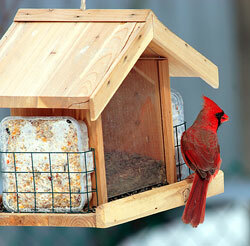 Keep the feeders filled so that birds know they can count on the food source. And clean feeders periodically. If you have ever seen birds playing in a sprinkler or splashing in a puddle after a rain, you know that birds not only need water, they enjoy it. The simplest way to provide water for birds is to set up a birdbath, which also can be an attractive ornament for your yard. Make sure that your birdbath is no more than 3 inches deep. During mosquito season, dump out the water and replace it with fresh water two or three times a week, so that mosquito eggs don’t have a chance to hatch – and so that the birds have fresh water. Place your birdbath high enough so that other animals can’t drink it dry, and place it far away from potential predators. Birds need a place to get away from their enemies, and a place to raise their families. You can provide both by planting shrubs and bushes as well as trees. You also can put up birdhouses. Different birdhouses attract different species of birds, so choose your house – or houses – carefully. For example, purple martins, which are prodigious mosquito-eaters, enjoy living communally in large apartment-type birdhouses. Smaller songbirds prefer to live in single-family homes, with entrances that are small enough to keep out predators. Once you have made your yard bird-friendly, just sit back and enjoy the show.